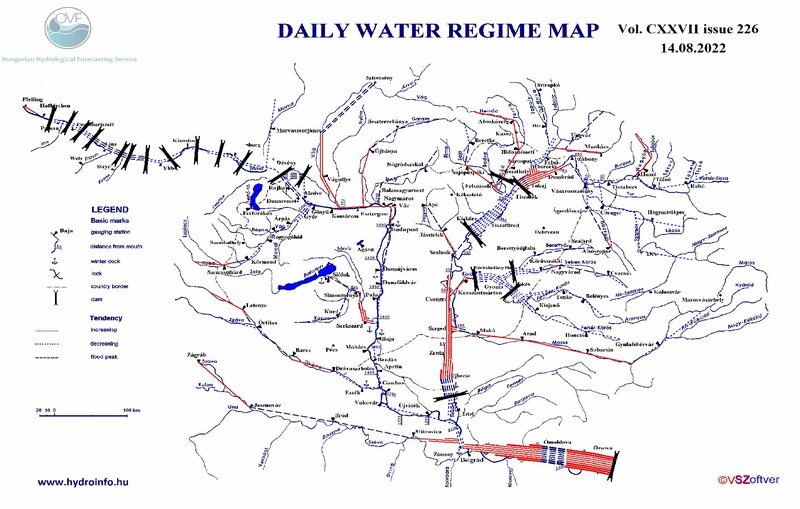 Daily Water Regime Map presents hydrological conditions and expected water levels along the main rivers. In order to give a comprenhensive overview, water courses and river sections outside of Hungarian border are also included. Water level values are expressed as percentage of historical water regime and are presented by lines along rivers. The more line a band on a river is made of, the heigher the water level is in the given section. Each line corresponds to 10% of the total water regime. One line indicates very low water, ten lines indicate the highest high water. For a better illustration of water level height, water level values above 50% are denoted with thick lines. In case of extreme floods, exceendance of the 100% value is indicated by a wavy line drawn beside the 10th straight line. Rising limb is marked with continuous red line, flood crest is marked with black broken line and descending limb is marked with blue dotted line.